This edition of our electronic newsletter is coming to you at a different time and in a slightly different format, so that we can invite you to take part in a special event and in some new initiatives at the School. First and foremost, we want to invite you to attend the dedication of our new building, and the very special event that follows. This dedication marks the start of a new chapter in biomedical engineering and research at Purdue, and beyond. Second, we have two new initiatives to announce. One is focused on education, and one on advancing biomedical engineering communications. We hope that you will take part in both of these, and join us in celebrating a new scholarship. The foundation of the Weldon School of Biomedical Engineering is the pioneering research and education accomplishments of those who started biomedical engineering at Purdue in 1974. The future we build, the next generation of biomedical engineering, will be the result of your activities, accomplishment, and involvement. We look forward to seeing you at the dedication and your participation in creating an even brighter future. Ken and Kitty Decker are a true Boilermaker family. Both come from a long line of alums and friends of Purdue. They passed their love of Purdue on to their two daughters, who graduated from Purdue and married Purdue graduates. The Decker family also understands the importance of giving back, as exemplified by their numerous gifts to Purdue. The Weldon School of Biomedical Engineering is both fortunate and honored to be the beneficiary of a gift from this fine family. Their gift establishes the Havel/Decker Undergraduate Scholarship in Biomedical Engineering, the first undergraduate scholarship to be established at the School, to be awarded to a deserving sophomore or junior each year. "We very much appreciate our alumni and friends who give to the Weldon School of Biomedical Engineering, and are especially pleased when such gifts have a direct positive impact on our BME students," says George Wodicka, head of the Weldon School of Biomedical Engineering. "The Deckers' gift not only honors family members, it helps us recruit and retain the best biomedical engineering students in the world." Our thanks to the Deckers and all alumni and friends who support the Weldon School. Your support is the base upon which we build the future. No, it is not a bad re-make of an old movie, but an effort designed to harness the power of new media to biomedical engineering research and education. Blog is a contraction of Web Log, and the more than 20 million blogs range from personal journals to news aggregators to expert coverage of highly specialized topics. One of the key features of blogs is a response time to events or news of minutes or seconds, as opposed to traditional days or weeks response of more traditional media. It is this rapid response time that is reshaping news, corporate communications, and research communications. The Weldon BME blog (http://weldonbme.org), which is just starting operations, is an initiative to provide not merely communications about the Weldon School, but to create a biomedical engineering-focused resource within this new world of communications. It was developed with the assistance of an advisory board that includes two of the fifty most read bloggers in the world, and other expert resources. The blog consists of two main parts: the sidebars containing "blog rolls" (listings of links to specialized resources of interest), and the central column that will feature news, articles, and discussions. Making it a success will also depend on two parts: the dedication of those within the School who have agreed to provide content, and you. We need your inputs on the individual blog rolls, so that we can add new and important resources, fix any bad links that may come up, and to add new blog rolls to help meet your needs. We need your help in finding and linking to news and other stories of interest to biomedical engineering. Finally, we need you to provide us with content that will provide additional perspective, history, news, and other information on biomedical engineering and the things that affect it. For more information, or to take part, please contact Blake Powers at powersc@purdue.edu or at 765-494-3940. It is with mixed emotions that I announce that Alyssa Wilcox has stepped down as the Director of Development for the Weldon School of Biomedical Engineering. Alyssa's husband, Michael, has just completed his doctoral degree at Purdue and has accepted a faculty position at the University of Tennessee. So, Alyssa, Michael and Catherine are moving to Knoxville. As you know, Alyssa has been our development officer since 2002. She has been instrumental in taking our Biomedical Engineering enterprise from a department to the first named School in the history of Purdue Engineering. Maybe more importantly, she has touched the lives of all of our alumni, friends, faculty, staff, and students to create an extended Purdue Biomedical Engineering family. 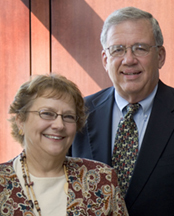 We are very sorry to see her, Michael, and Catherine leave Purdue, but we wish them the best in their new endeavor. Please address questions to Brian Knoy, Manager of Stewardship-Weldon School of Biomedical Engineering at (765) 494-6241. On Friday September 22nd, a dream that began in 1974 will take new form, and the Weldon School of Biomedical Engineering will have a new home. Please mark the day, and join us in our dedication and house warming for our state-of-the-art facility, the first of its kind in Indiana and a world-wide flagship facility for biomedical research and education. In addition to a reception, we hope you will also attend a special symposium honoring the heart of biomedical engineering at Purdue: Dr. Leslie A. Geddes.